This fried chicken is FANTASTIC! I call it gourmet because there’s a lemon and wine sauce drizzled over the chicken, before serving. To keep it skinny, it’s fried in a very small amount of reduced-fat butter and olive oil. Each serving has only 224 calories, 6 grams of fat and 5 Weight Watchers SmartPoints. A must try! 1. Place the chicken breasts on a plate. Season chicken with a little salt and pepper and lightly dust with flour. 2. Beat the egg white with milk in a shallow bowl. Toss breadcrumbs and Parmesan cheese together in another shallow bowl. 3. Dip each piece of chicken in egg white mixture, coating both sides and dredge in bread crumb/Parmesan mixture and set aside. Continue with the rest of the chicken. 4. Coat a large nonstick pan with cooking spray. Add 1 tablespoon butter and 1 teaspoon olive oil and melt over medium-high heat. 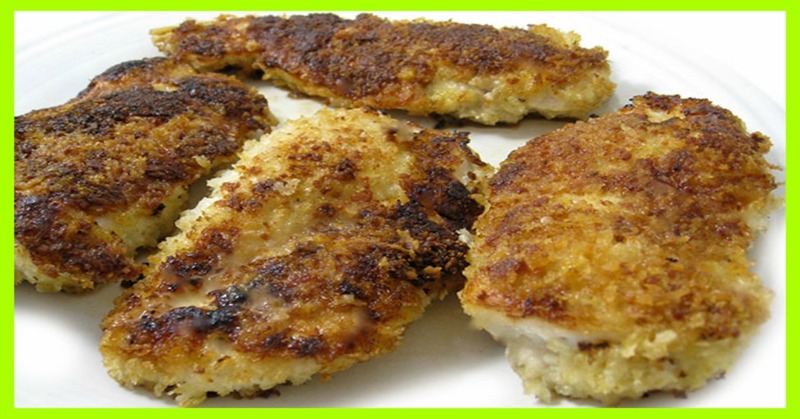 Add the 4 breaded chicken breasts, cover pan and cook for 4-5 minutes until browned and crispy. Turn chicken over, add remaining tablespoon butter to pan and swirl around to melt. Cover pan, turn heat down to medium and continue to cook for 4-5 minutes until browned and cooked through. Remove chicken to a serving plate. 5. Add the wine and lemon juice to the pan and heat for about 2 minutes over medium heat until pan sauce is slightly reduced. Panko bread crumbs come from Japan and are typically used to coat foods for frying or sauteing. They’re coarser than most bread crumbs and create a crisper crust. Panko bread crumbs are available in most supermarkets in the Asian section. I bought mine at Trader Joe’s. No need to use an expensive wine for this recipe. I always have on hand in my refrigerator a cheap bottle such as Trader Joe’s Charles Shaw Chardonnay. It’s about $3.99 a bottle. Today it seems most packaged chicken breasts weigh more than 4 ounces each. If the breast is larger or too thick, slice in half lengthwise through the entire piece to create 2 breasts.